“A truth that many political parties active in the Maldives accept is that the MDP is unmatched when it comes to election campaigns,” declared a Haveeru report or op-ed published on April 21, 2013. The high praise was surprising coming from a publication that is not known to favour the Maldivian Democratic Party. It was a sign of shifting political tides. The report appeared a day after the MDP held the largest rally by a political party in the country’s history to celebrate the signing of Speaker of Parliament Abdulla Shahid. Grudging acknowledgment of the MDP’s grassroots support, innovation and enterprise was a common sentiment in the aftermath of the mass rally. The most significant observation in the Haveeru report, to my mind, was this: “MDP is the party that introduced many democratic concepts [to the Maldives].” The author observed that it was the MDP that introduced “door to door campaigning,” “manifesto,” “haruge and campaign jagaha (meeting halls)” into the local vocabulary. Other political parties have since followed in the footsteps of the pioneering party by adopting these phrases. The MDP was born out of a pro-democracy movement in the wake of unprecedented civil unrest in September 2003, which was precipitated by a custodial death exposed to the public and fatal shooting of inmates. 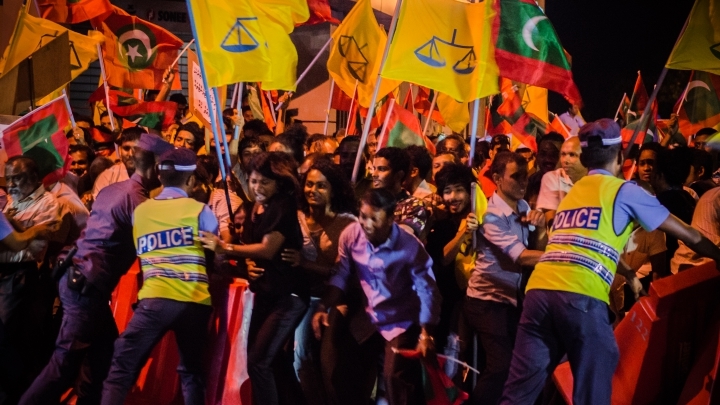 The movement culminated in the election of Mohamed Nasheed as president in October 2008, ending a 30-year autocracy and heralding a new dawn for the Maldives with unheard-of levels of freedom of expression and civil liberties. As a voter in tomorrow’s historic election, the considerations for choosing a candidate sadly remain much the same as in 2008. Five years ago, a majority reached the conclusion that Nasheed was the only choice. Apart from Ibrahim Ismail ‘Ibra,’ he was the only candidate with genuine democratic credentials. The others could not be trusted to dismantle the autocratic status quo. The dictatorship of President Maumoon Abdul Gayoom was characterised by repression, torture, nepotism, wanton corruption, income inequality and self-serving Islamo-nationalist propaganda on state media. If Gayoom was re-elected and emboldened with a mandate, the fear was that he would crush the opposition and jail its leaders or force them into exile. An independent auditor general would not dare reveal illegal expenditure, the judiciary would remain under his thumb, and the nefarious security forces would once again be used to stifle dissent. As for the rest, including current presidential candidate Gasim Ibrahim and his running mate Dr Hassan Saeed, they lost credibility to speak of democracy by perpetrating the televised coup d’etat on February 7, 2012 and because of their disgraceful behaviour while in opposition: relentless efforts to topple the government, blocking the Nasheed administration at every turn, obstructing essential tax reforms, deliberately sabotaging the economy and whipping up religious hatred. Their commitment to stability and democratic processes was on display at the Republic Square on the day we lost our hard-won democracy. I believe the overriding issue of this election is saying no to the coup and police brutality. What is at stake here is a second chance at consolidating democracy. According to the “two-turnover test” of political scientist Samuel Huntington, an emergent democracy must undergo two peaceful transfers of power to become stable. The February 7 coup threatened a complete authoritarian reversal and imperilled the fraught transition. If the coup had not happened, tomorrow’s election would take the Maldives closer to a functioning democracy regardless of the winner. As it stands, the only hope is a victory for the democratic party. The same cannot be said of the Maldives. It is harder to justify withholding support to the most liberal president we are likely to see in our lifetime when the other candidates represent a cabal of authoritarian loyalists, oligarchs and Islamists that employed mutinous security forces to overthrow the first democratically-elected government. In other words, the possibility of coup perpetrators winning the election should be part of the equation for voters unconvinced by Nasheed. This election is bigger than one person. Idealists who cannot bring themselves to vote for Nasheed should consider the consequences of the alternative and take a long view: living in a police state ten years from now where the Islamist party has revamped the education curriculum. Whatever issue you have with Nasheed will seem petty then. * In the first 24 hours, the same Specialist Operations (SO) police officers who instigated the coup d’etat with a violent mutiny baton charged an MDP march, leaving dozens of unarmed civilians in the ICU with head injuries. * In June this year, the police disciplinary board decided not to take any administrative action, such as suspension, against five officers facing criminal prosecution over police brutality on February 8, 2012. In the most egregious case of impunity, a staff sergeant who was caught on tape kicking a fallen protester was promoted despite the Police Integrity Commission forwarding a case against the officer for prosecution in May 2012. * The Maldives plummeted to 103rd in the Reporters Without Borders Press Freedom Index, a return to pre-2008 levels after climbing to 51st in 2009. I can personally testify to the state of press freedom in the aftermath of the coup. On August 30, 2012, I was arrested for the crime of pointing a camera at SO officers. * Weeks after coming to power, the new government rewarded resort tycoons by allowing extended resort leases to be paid in instalments rather than upfront or in a lump sum at the end of the lease. The Maldives Inland Revenue Authority (MIRA) revealed in April 2012 that revenue collected in March was 37.9 percent lower than the projected revenue “mainly due to the unrealised revenue from the Lease Extension Period.” The lost revenue amounted to MVR352 million (US$23 million). * Despite an ongoing budget crisis, the government had the funds to promote more than 1000 officers, hire 110 new officers, seek recruits for a “special constabulary” reserve force, introduce a loan scheme for police officers, make arrangements for officers and their families to receive cheap accommodations and medical treatment in Sri Lanka and award 600 flats to police and military officers. * In January 2013, former chief of police intelligence, Chief Superintendent Mohamed ‘MC’ Hameed revealed to a parliamentary committee that 1,112 officers were promoted the previous year despite only 600 forms being submitted under the normal promotion procedure. “What we saw was that officers with a disciplinary record from the floor to the ceiling were given promotion by the executive board,” Hameed told MPs. * In late November 2012, the Finance Ministry revealed that GDP growth of the tourism industry had flatlined in 2012 to 0.7 percent, falling from 15.8 percent in 2010 and 9.1 percent in 2011. Economic growth meanwhile slowed to an anaemic 3.5 percent, significantly down from 7.1 percent growth in 2010 and 7 percent in 2011. * In February 2012, the new administration abolished the Maldives Volunteer Corps. * The public sector wage bill skyrocketed 37 percent in 2013 with MVR1.3 billion in additional recurrent expenditure, including a 14 percent hike in military spending and plans to hire 864 new staff for the security services. * “[The coup perpetrators] have destroyed US$2-3 billion worth of investment and condemned the country to an unstable economic future based upon diesel”: Mike Mason in June 2012. * In November 2012, the President’s Office Spokesperson publicly insulted the Indian High Commissioner, sparking a diplomatic incident and souring relations with India. * In the next month, the government arbitrarily terminated a concession agreement with the GMR-MAHB consortium to manage and develop the Ibrahim Nasir International Airport, a move that arguably shattered investor confidence and could force the country to pay the GMR US$1.4 billion as compensation. * In December 2012, the pro-government majority in parliament passed a draconian law that restricts freedom of assembly.